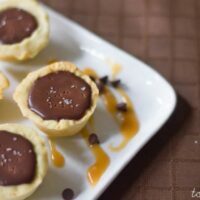 Shortbread crust, chocolate ganache and salted-caramel make these tartlets an irresistibly decadent dessert! Hi everyone! It’s Mallory from Total Noms and I’m really happy to be able to be guest posting on Java Cupcake today! Betsy and I first became buddies when she graciously guest posted for me while I was out on my honeymoon in October 2013. Her Peaches ‘n Cream cupcakes quickly became one of the most popular posts of the last few months for me, and there’s no mistaking why- Betsy is a total whiz when it comes to delicious and beautiful desserts! So I’m honored to be able to share a recipe with you today that I hope can hold up to the level of sweet beauty of Betsy’s normal fare. The truth is, I’m an absolutely TERRIBLE cake decorator (for proof, see here from the early days) so when it comes to desserts, I usually stick to the kinds that require minimal design capabilities. Drop cookies, pies, and bars are my thing. It’s really hard to make those ugly! 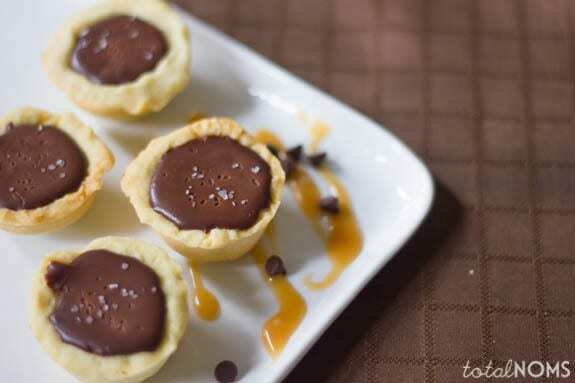 Case in point- these little Salted Caramel Chocolate Tartlets. It’s pretty much impossible to make something terrible out of shortbread crust, chocolate ganache, and oh yeah, salted caramel. Sure, I might have caramel sauce stuck all over my stove top, fingers, and plates now, and there might be chocolate ganache drips all over my fridge shelf where I let these cool, but the finished product, man- it’s a doozy! And no decoration required! 🙂 Just a little sprinkling of salt on top is all you need! Adapted from Sprinkle Bakes, originally from The Perfect Finish: Special Desserts for Every Occasion. 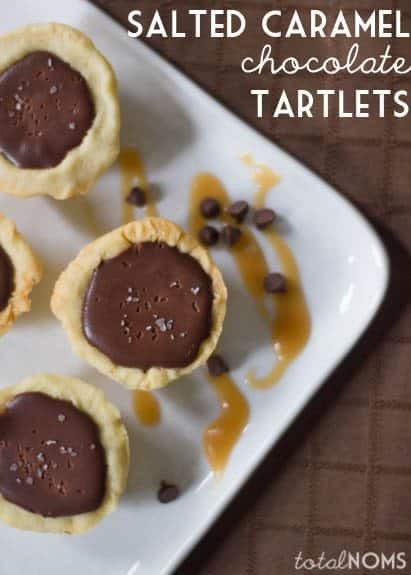 You may end up with a little extra salted caramel and chocolate ganache from this recipe (if you were able to keep yourself from dipping into them while assembling). This may seem like a tragedy, if you’re crazy. You can store the salted caramel in the fridge in an airtight container for up to a week. Use the chocolate ganache within a few days, again storing in an airtight container in the fridge. Both are perfect as dips for fresh fruit, cookies, or biscotti! Thanks so much for reading, and feel free to come visit Total Noms anytime! You can also find me on YouTube, Facebook, Google + and Pinterest. My warmest, most-heartfelt thanks goes to Mallory from TotalNoms for sharing this delicious recipe with my JavaCupcake readers! Mallory recently was married and I had the opportunity to guest post for her! We have become sweet internet blogging friends and I hope to continue to work with her to share sweet recipes with our readers! If you’d like to see more of Mallory’s delicious creations, check out her blog TotalNoms or find her on Facebook, Pinterest, YouTube, Instagram and Twitter. Using a hand or stand mixer, beat the butter and sugar together in a large bowl until light and fluffy. Add the eggs and beat again until combined. Add the flour and salt, and mix until a dough has formed. Remove dough from the bowl, form into a ball and wrap in plastic wrap. Refrigerate for one hour. Spray a mini muffin tin with cooking spray. Between two sheets of parchment paper, roll out chilled dough to 1/4" thickness. Using a biscuit cutter or other circular stencil, make 2.5" circles and press them down into the muffin tin, making sure to press down the bottoms fully into the pan. 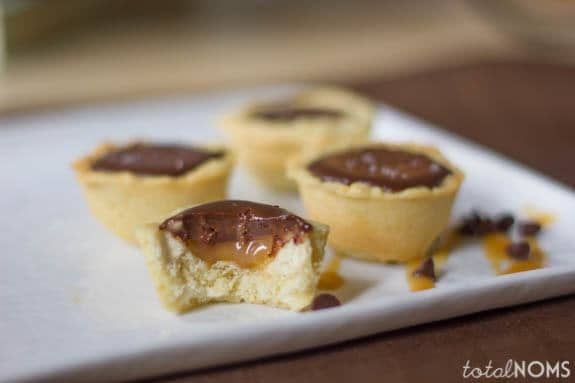 Stab a fork into the bottom of each mini pie crust. Freeze for 5-10 minutes until dough is fully hardened. Preheat oven to 350°F. Press a piece of foil over top the pie crusts, and carefully press the foil into each divot of the muffin tin so that its completely covering and touching the dough. Add pie weights, coffee beans or other dry beans into the divots to weigh the foil down. Bake for 30 minutes. Melt the sugar in a medium saucepan over medium-high heat, whisking often. Once sugar is completely melted, add the room temperature butter, continuing to whisk (mixture will bubble!). Carefully add the heavy cream and whisk- this will cause a lot of bubbling as well. Once mixture is smooth, remove from heat, and stir in the salt. The caramel will look very liquidy, but it will thicken as it cools. Allow to cool while you make the ganache. Bring heavy cream just to a boil in a small saucepan. While cream is heating up, place the chocolate in a large, heat-proof bowl. Once cream comes to a boil, immediately pour over the chocolate and stir everything together until it comes together as a rich, beautiful chocolate ganache. Resist the urge to eat the whole bowl right then and there. yay! Love both of you just like I love chocolate AND salted caramel! I love salted caramel! It is one of my favorite combinations. Stopping by from the SITS share fest.